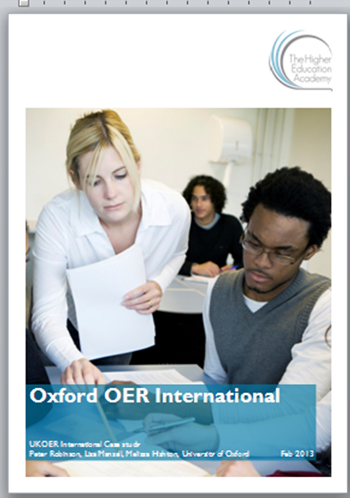 The purpose of Oxford OER International was to identify suitable elements of the University of Oxford’s existing OER collection to be showcased internationally. By improving the web presence of Oxford’s OER outputs, designed with the international user in mind, the project was able to promote a selection of resources hand-picked for their suitability for an international audience. The project enhanced the potential for engagement with international audiences by ensuring that the selected content was more easily discoverable through improved descriptions and additional metadata to indicate level (introductory, intermediate, advanced). Advocacy from world-class academics and appreciative users, clear routes to Oxford’s other OER projects, and the inclusion of other links focussed on international admissions were all included to present a true showcase of Oxford’s best international outputs. The project evaluated strategies to improve discoverability of content by a global audience and investigated a range of tracking and feedback methods for understanding their use. This case study highlights successful approaches to understanding the needs of an international audience, for example by exploring how improved cataloguing metadata can be used to enhance discoverability and by demonstrating how targeted promotion of relevant content through better visibility and marketing can lead to higher usage and by introducing a tracking analytics strategy to evaluate usage and search behaviour. It also includes a simple 5-step methodology which is offered as a model for other OER creators to follow. You can now read the full case study online.